Tonight’s the night: following his departure from Calvin Klein just a few weeks ago, Raf Simons has decamped from NYC and landed back in Paris to debut exactly what he’s been working on for AW19. What went down? Here’s everything you need to know. ...as seen in David Lynch’s cult neo-noir mystery Blue Velvet. 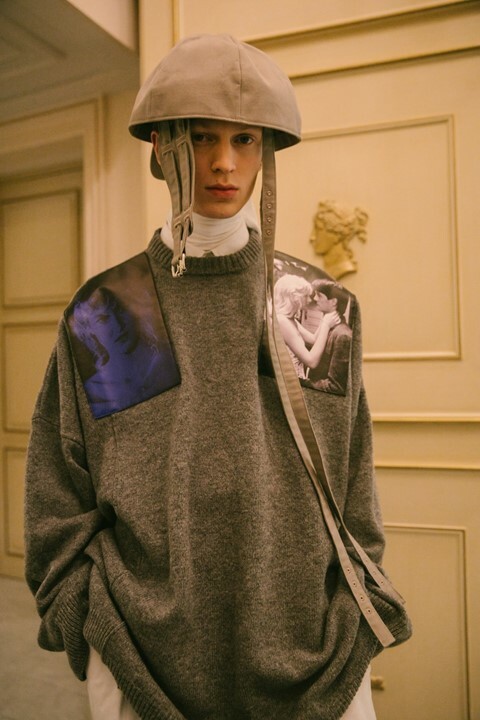 It’s news to no one that Simons is a self-proclaimed Lynch stan: not only does he regularly reference the iconic auteur’s movies within his collections, he even went as far as to dedicate his AW16 show to him, given it took place on his birthday. But while Lynch wasn’t present to see the show take place, Dern actually showed up to take her place on the FROW. Yes, seats. Raf Simons has held standing only shows since SS15, but this time guests were treated to chairs. Models walked down the narrow rows formed by the gilt chairs at the particularly bougie Shangri La hotel: a far cry from last season’s warehouse on the outskirts of Paris. Simons has made his love for Joy Division known from day one, and this season their seminal 1980 track “Atmosphere”, with its highly poignant lyrics (“Abandoned too soon, set down with due care, don't walk away in silence), provided the soundtrack. There was also a performance from Belgian post-punk band Whispering Sons, who played throughout and into the finale. ...but what were you expecting, given the invite? On the line-up tonight were a series of oversized, wide-shouldered coats and jackets, many of which were covered in stills from Lynch films including Wild at Heart and Blue Velvet, as well as jackets trimmed with black cherry keychains (perhaps in reference to some damn fine cherry pie?) and flower embellishments. Finishing off the collection – which was mainly neutral in colour, with flashes of colour throughout – were chunky leather shoes, leopard print gloves, and helmet-like hats, which most of the boys walking wore. Prior to the show, guests received an email alerting them that there would be an intermission during the show. The lights changed through blue, red, and pink hues as instrumental noise blared out from the speakers for just over five tense minutes before the models started their circuit once again. A statement in relation to how fashion needs to slow down? Quite possibly. ...between Raf and none other than Frank Ocean, who headed backstage to wish the designer congratulations. Name a more iconic duo? No, sorry: not possible.